Good day out. Excellent tour. The view is gorgeous and the spa is relaxing. Our guide, Wawan is very professional and take good care of us. Our tour guide, Dedi, was terrific! Personable, well informed and very conversational. The site is magnificent. Our driver did a great job of navigating Bali’s awful traffic and crazy drivers. Our tour guide was great, and the temple was beautiful. The title is a little misleading as we had to leave the temple about 45 minutes before sunset to make our spa appointment on time. Other than that, the tour was great! Was awesome to to see, however be prepared for huge crowds. 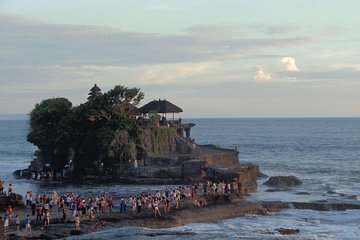 I really enjoyed going to Tanah Lot, and the guide that came with us with fantastic. However, I have never been to such a busy tourist place before. If you can cope with the crowds there, then it's worth it. We also never got to see a sunset as unfortunately the weather can be unpredictable in Bali, and therefore it was too cloudy to see a good sunset which was a shame. However, we opted for the opt in of the spa treatment and got a couples massage, this was the highlight for me! The spa was stunning, and it was a fantastic massage, very professional and in a great setting.